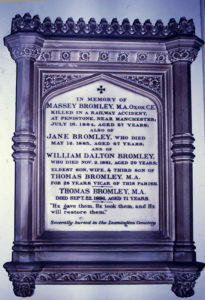 Massey Bromley has at least two connections with Leamington Spa; he was a pupil at Leamington College and also he is buried in Leamington cemetery in Brunswick Street and has a memorial in St Mary’s church. 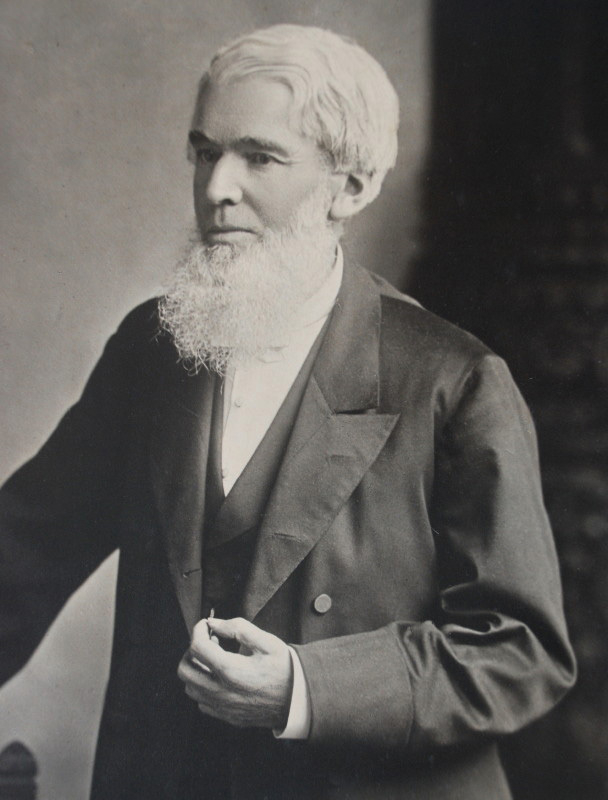 He was pretty unique in that he was possibly the only locomotive superintendent with a railway company at the time who had a Master of Arts degree from Oxford University. Another much more regrettable claim to fame is that he was perhaps the only one-time locomotive superintendent who was killed in a railway accident as a simple fare-paying passenger by the failure of a locomotive. Most sources say that he was born in Wolverhampton in 1846. His father, Thomas, became the vicar of St Mary’s church in Leamington in 1856 and Massey went to Leamington College. His father supervised the construction of St Paul’s church in Leamington which opened in 1874. Massey obtained his MA at Brasenose College, Oxford, and soon embarked on an engineering career. He became an apprentice at the Stratford works of the Great Eastern Railway Company in London. By 1874 (at the age of 28) he was Works Manager at Stratford. In 1876-77 he went to the USA and saw early 2-6-0 locos with which he was very impressed. Express locos in the UK at the time were 4-2-2 or 4-4-0 configuration. Massey designed a fine 4-2-2 for the GER. He became locomotive superintendent for GER from February 1878 until August 1881 when he resigned. He had a hand in designing several locomotives. After leaving the GER in 1881 he entered into partnership with J C Wilson who he had met at a loco works in Bristol; they formed a firm of consulting engineers. Over the next few years Massey became well respected for giving expert evidence in court about engineering matters. Very sadly he died in July 1884, at the age of 37, in a railway accident at Penistone as the train headed downhill east of the Woodhead tunnel nearing Sheffield on the Manchester, Sheffield and Lincolnshire Railway. It was caused by the failure of a driving wheel axle on the locomotive. A total of nineteen passengers were killed on the spot and five more were mortally injured. It was reported that . . . “his injury was hardly perceptible, and his face wore a calm and placid expression . . .”. There were several railway accidents in the vicinity of Penistone and this one was known as the Bullhouse Bridge accident. Massey was buried in Brunswick Street cemetery, Leamington, after a service at St Paul’s church. 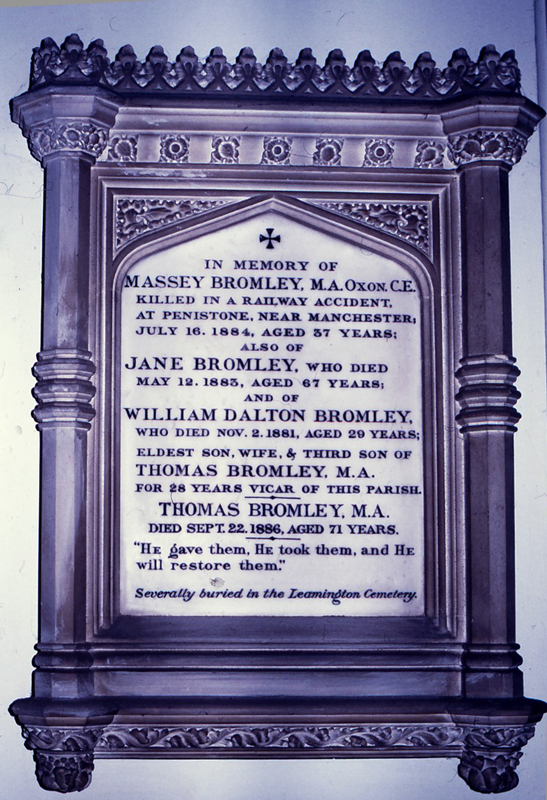 He never married and his legacy of £8,235 was passed to his father, Rev T Bromley.